Kanchenjunga (8536m) and other Himalayan giants, visit Potala Palace, Sera Monastery. Day 09: Drive to Rongbuk (5050m/16564ft)-Explore EBC (5250m/17,220 ft)-85 km. Day 01 :Arrive Kathmandu Land at Tribhuvan International airport in Kathmandu and you will be received by Wilderness Excursion company representative and transferred to the selected hotel. And a short briefing about your trip. Stay overnight in hotel in Kathmandu. Day 02 :Kathmandu valley tour and preparation Full day Sightseeing in UNESCO listed historical sites such as Kathmandu Durbar Square, Boudhanath, Swayambhunath(monkey temple), and Pashupatinath in Kathmandu Valley with experience Tour Guide by private car/van, afternoon preparation for Tibet tour. Stay overnight in Hotel. 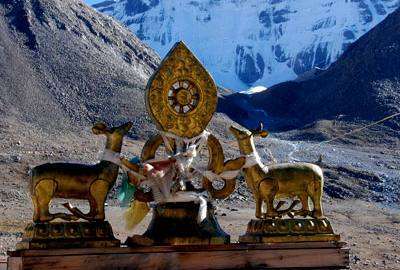 Day 03 :Arrive in Lhasa by flight Your Lhasa Everest Base Camp Tour starts with your arrival in Lhasa today. Kathmandu to Lhasa you will have 1 hour 10 minutes Trans-Himalayan flight which is considered one of the most attractive air routes in the world that takes you over the Everest (8848m), Kanchenjunga (8536m) and other Himalayan peaks. You will be received by our Tibetan guide at the airport. Nearly 1.5 hours’ drive along 93 km road, from the airport, you will reach Lhasa. It’s advisable to rest and take it easy for the remainder of the day due to Lhasa’s altitude. Overnight at hotel in Lhasa. Day 04 :Explore Lhasa Today's program starts with a visit to Sera Monastery with your tour guide. This is a preserved monastery of white-washed walls and golden roofs. Equally adventurous and exciting rhythm builds up while touring Norbulingka, the summer palace of the Dalai Lama. Jokhang Temple is another important holy site which unravels more deep seated mysteries of Tibetan Buddhism. Visit to Barkhor Markets can be quite a alter from other visits as you wander around the city trying every details around the stalls and you may purchase some goods that displays Tibetan culture, custom and tradition. Overnight at Hotel in Lhasa. 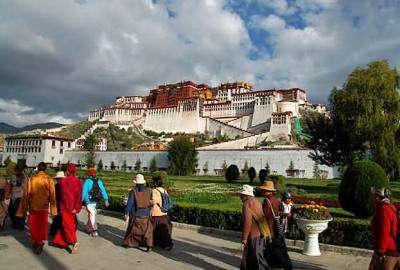 Day 05 :Second Day Lhasa Explore Visit to Potala Palace and Drepung monastery will grant invaluable insights. From the Mar Po Ri Hill where the Potala Palace, the 17th century great monumental structure stands, you can get an tremendous view of entire city. Potala Palace, a huge structure, its interior space being in excess of 130,000 square meters has private quarters of the Dalai Lama, many grand state rooms and chapels. Your next visit will be to Drepung Monastery, a residence of Dalai Lama before Potala Palace which was built in 14th century and used to shelter around 10,000 monks some time ago. Tibetans’ immensely believe and respect this monastery. Overnight at Hotel in Lhasa. Day 06 :Drive to Gyantse Following Friendship Highway, while driving past Khamba La (4794 m), you will have a break to appreciate majestic views of Yamdrok-Tso Lake, a lake deep blue in color and Nazin Kang Sang glacier standing proud at 7252m. Ahead to westwards, you come across another Karo La pass at 5045m. Glance through the road, you can see huge glaciers tumbling down into the road. After hours of driving for 261 km, you enter town of Gyantse where you will see beautifully landscaped Tibetan villages. Overnight at Hotel in Gyantse. Day 08 :Drive to Shegar (4150m/13612ft), visit Natang and Sakya Monastery en route-274km Today you will transverse along the Friendship Highway amidst picturesque landscape driving past small town of Lhatse and Gyamtso La pass at 5220m. You will visit Natang Monastery which is 12 Kms far from Xigatse, again you drive to Sakya Monastery, where you can see the largest book in the world in Sakya’s great library written in gold. In the evening time we reach in Shegar. As the route opens into plains, many monasteries and camps of nomadic herders become visible in route to Shegar. Overnight at Guest house in Shegar. Day 09 :Drive to Rongbuk (5050m/16564ft)-Explore EBC (5250m/17,220 ft)-85 km. Away from Shegar, you drive to the south crossing Pang La pass at 5150m/16890. Along the drive, you can laze around in the splendor of majestic views of snowcapped peaks such as Makalu and Shishapangma. After driving for 85 km, you eventually reach Rongbuk from where you get spectacular sight of Mt. Everest. The program today is to explore to Everest Base Camp through the day. Drive to EBC is allowed only for expeditions, so you need to walk 8 km (one way) or take a horse or local bus to reach the Everest Base Camp. 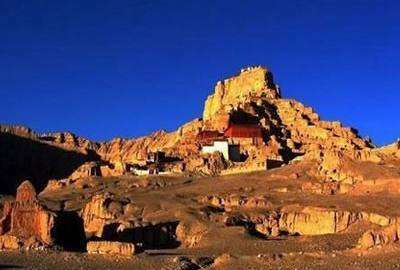 You will also visit Ronbuk Monastery, a Buddhist pilgrimage site founded in 1902 by a Nyingmapa Lama in an area of meditation huts that had been in use by monks and hermits for over 400 years. Hermitage meditation caves dot the cliff walls all around the monastery complex and up and down the valley. Many walls and stones, carved with sacred syllables and prayers, line the paths. Overnight at Guest house in Rongbuk. Day 10 :Drive to Zhangmu (2300m/7, 544ft)-245 km In case, on Day 07 due to bad weather or some consequences, if you are not able to explore around Everest Base Camp, today’s first light will be utilized to explore around Everest Base Camp and to watch sunrise on Mt. Everest. 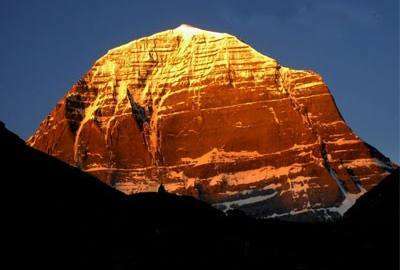 It is a truly awe inspiring place with the absolute north face of the highest mountain in the world soaring above you. You return back to the Friendship Highway to continue drive to Zhangmu. Driving past Tingri crossing Lalung La pass at (5124 m/ 16068 ft) and Shung La pass at (5200 m/ 17056 ft), Nalyam Pass (3800m/12464 ft) which offer enchanting views of the surrounding peaks of Shishapangma, Cho Oyu, Menlungtse and Gauri Shanker, you tumble down from gradually from the dry Tibetan Plateau. Now, you find yourself amidst the verdant and fertile vegetation of Zhangmu at 2300 meter in the Nepalese border.Overnight at Guest house in Zhangmu. Day 11 :Drive to Kathmandu (1350m/4428ft)-123km Few kilometers drive away from Zhangmu to Friendship Bridge across Bhote Koshi River brings you closer to Immigration Control in Kodari where you depart with your Tibetan guide and driver, and walk across the river to meet Nepalese guide to drive to Kathmandu. After 4 hours of driving through deep valleys, you finally arrive in Kathmandu. Overnight in Kathmandu (hotel included in Kathmandu). Day 12 : Departure or extend your trip Fly back to home or next destination. After visiting Tibet now I reccomend ralxing Chitwan Jungle Safari or relaxing Pokhara stay. Guided culture tour in UNESCO listed World Heritage Sites in Kathmandu Valley. 2 Nights deluxe bed room in 3 star hotel in Kathmandu on double occupancy.. Pick up and drop off service by our Tibet tour guide from Zhangmu and Lhasa Gonggar Airport. Meal: all breakfast during the tour in Nepal and Tibet. well maintained private vehicle throughout the whole tour according to group size. 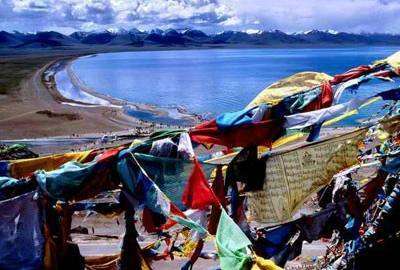 China Visa and Tibet entry permits.